Home » Ladder or Latter – What’s the Difference? Homophones are words that have similar pronunciations but different meanings. Ladder and latter are two homophones that give many writers trouble. In reality, these two words are never interchangeable, since they are actually different parts of speech. One is a noun, while the other is an adjective. Even if you get them mixed up, most astute readers will be able to discern what you mean by looking at the overall context of the sentence. Still, word choice is important, especially for academic and professional writing, so you will need to know the difference between these confusing words. What is the Difference Between Ladder and Latter? In this post, I will compare latter vs. ladder. I will use each word in at least one example sentence, so you can see how it appears in context. I will also show you a mnemonic device that makes choosing latter or ladder a bit easier. What does ladder mean? Ladder is a noun. A ladder is a device with rungs that can be climbed to reach high places. Ladders may be short, with a small number of rungs, or very tall, with many rungs. Ladders can be fixed in place or portable, and some can extend and retract for easier transport. The fireman climbed the ladder into the burning building to save the old woman. Sutton leaned a ladder up against the water tower and climbed up to the top. Ladder can also be figurative, like in the expression climbing the corporate ladder, which refers to professional advancement in a company. What does latter mean? Latter is an adjective. It means the second or last of something. Members of the Church of Jesus Christ of Latter Day Saints are so called because they view themselves as saints living in the last days before the return of Jesus Christ. Elsewhere, the terms former and latter refer to the first and second items, respectively, in a list or comparison. Between gin and tequila, I will usually choose the latter option, while my boyfriend usually chooses the former. Jim can’t decide between his company’s 401k and a Roth IRA; he likes the employer match of the former, but the tax-free earnings of the latter. For more in-depth discussion of former vs. latter, see here. 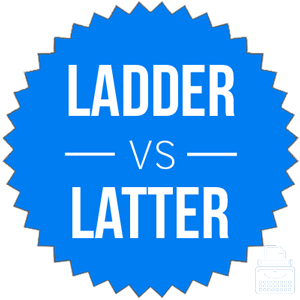 Latter and ladder are homophones, which can make it confusing to remember when to use each. Luckily, there is an easy memory tool, called a mnemonic device, that makes remembering the difference between these words simple. Ladder vs. Latter Check: Since latter can refer to the last item in a pair, and latter and last each contain the letter T, you should have no trouble reserving latter for these contexts. Is it ladder or latter? Despite their similar pronunciations, these words are not interchangeable, so you will need to remember the difference between these confusing words. A ladder is a device with rungs that allows people to climb to high places. Latter is an adjective that refers to the second item in a comparison, or the last of something. 1 What is the Difference Between Ladder and Latter?